This is a guest post by author Miantae Metcalf McConnell – I was so impressed she got her book featured in Oprah magazine, and I asked her to share what that process looked like. Every month O, The Oprah Magazine publishes a list of books that they recommend to their readers, a “Top Ten List” situated in the magazine’s Reading Room Section. The theme varies each month, and the editorial team does a fantastic job choosing books with meaningful content no matter what genre. My personal reading list has grown as a result, and I appreciate the thoughtful evaluations. Each of the O Magazine book selections receives a review by one of their editors. If your book is lucky enough to be included on that list, the result is just as you’d imagine—a ten-fold increase in book sales (at least) along with exposure and interest that impacts future success in a big way. 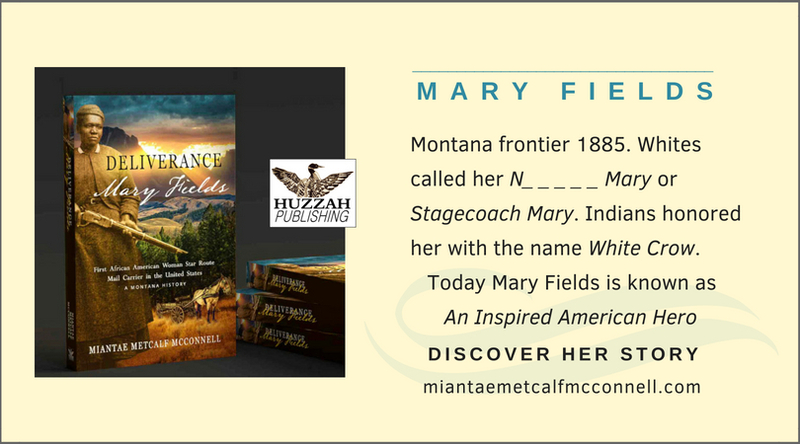 I wrote a creative nonfiction biography titled, Deliverance Mary Fields, First African American Woman Star Route Mail Carrier in the United States: A Montana History. (Yes, a very long subtitle.) This frontier chronicle written in novel style, reveals the most accurate biography of Mary Fields to date, coupled with pioneer subplots and wild Montanan politics. It took ten years of research to gather my treasure of undiscovered historical facts. I attribute the book’s success in part, to the outcome of my research: documents provided to USPS archivists that enabled them to establish Mary Fields as the first African American woman star route mail carrier in the United States; discovery of the 1912 Cascade, Montana Voter Registration Ledger that included Mary Fields’s name, date, and particulars—the first black to register for the vote in her town of residence; and, journal entries documenting many of Mary’s courageous and compassionate acts that benefitted multiethnic, often volatile, pioneer communities. The point being, I invested time to create something of value, like all of you have done, or are in the process of doing. The decision to tell Mary’s life-story as creative nonfiction after devoting years to obtain accurate new facts was a difficult one. I wanted readers to become emotionally involved, and how would that happen without dialogue? I wanted to reach a broad audience that would include the young adult market, and to see the book added to educational curriculums. The narrative grew close to 200,000 words. I felt the length necessary in order to provide an understanding of the complex multi-faceted social and political environment during the turbulent time period, 1885-1914. How would readers gain insight into characters choices without knowledge of mitigating circumstances and the options therein? When two mainstream publishers offered to publish the book if I would rewrite as nonfiction and cut the length in half, I declined, in order to stay true to my vision and belief that readers are quite capable and willing to read long narratives if the content is engaging. I’m happy to say that readers did not disappoint; many have thanked me for providing a broad time-period view and claim that the book’s length was time well spent. Eleven months after a print copy had been mailed to O, The Oprah Magazine, an email arrived from someone who said he’d like a book as he planned to review it. Eventually, I learned that he, Hamilton Cain, had been hired by the O Magazine to write the review for Deliverance Mary Fields, First African American Woman Star Route Mail Carrier in the United States: A Montana History. A few weeks later, notification followed: my book would be on the February 2018 Top Ten List. It was all very exciting, and also nerve wracking—I didn’t get to read the review until I purchased a magazine the day it arrived in stores. Of course, I’d welcome a repeat experience in a heartbeat! Sounds corny, but you are the one who envisions scenarios of your book’s future success. Devise a plan, or a plot to achieve your goals. I was apprehensive (another word for afraid) of the possibility of being interviewed because I am better at writing than speaking and thought I might make a fool of myself if I couldn’t remember a particular fact or date—that surely, I would make faux pas to agonize over for years. I dared myself to call the local newspaper, talked to the features editor, gave her a complimentary book. The end result was amazing! She composed an extensive, well written article about me—how I came to write a book about a black woman in nineteenth century Montana—and why. My photo, along with photos of my book were spread across the front page beneath the bold-typeface headline: “Black Woman’s Role in History Chronicled in New Book.” Facing irrational fear pays off! Talk about your project with enthusiasm, drawing interest and spreading the word. You know your book from the most intimate point of view. Sometimes that allows us to miss things that are obvious to others because we tend to focus on content. Ask for critiques. Listen. Sometimes a little humility sprouts new ideas. Evaluate thoughtfully, come to your own conclusions and move forward. Book signings, fairs, presentations, panels, conferences. Send print and digital copies of your book to online blog reviewers, to newspapers, magazines and social media sites that relate to your book’s subject matter. Make sure to get the current book editor’s name, and write a brief, professional inquiry. Have a general plan and keep updating the plan, as it will change. When I’m overwhelmed by all the choices and all the marketing projects I’ve decided are “mandatory” I take a moment to ask, “Which is the important task to work on now?” and take it from there. None of us can do it all. It’s all about choice. I’d rather be a turtle with long-term stamina—but when I’m acting like a hare, it’s less likely that I’ll become frenetic if I’ve begun my day prioritizing mindfully. You? CONTINUE BEING persistent! Tenacious! Optimistic! In summary, it wasn’t “difficult” to get my book in O, The Oprah Magazine. It was however, time consuming and tedious to create campaigns, websites, ads, press releases, media packets and a plethora of additional promotional sales materials and events, all of which gave me the chance to be considered for the Ten List. The book’s history—a steady increase in sales, reviews and rankings had surely been examined. As many of us discover, devoting a large amount of time to promotions can be an emotional challenge. I do think it’s worth doing—I figure I owe it to the book I created—seeing it through toddlerhood, at least. By the time the request from the Oprah reviewer arrived, I had invested a full-year towards promotion, instead of writing another book. (Some writers can do both, I found that I couldn’t and learned to be content making notes and outlines for future projects.) That was my choice. It’s a choice you may have to face. You can save a lot of time and money if you follow Derek’s advice. You’ll avoid publishing pitfalls and optimize your success. Buy his books, Write & Grow Rich, Create with Confidence, Guerrilla Publishing, to start. His website, CreativINDIE contains a jackpot of free videos and articles, where you can educate yourself without being teased and hounded by sales-offers. This speaks to his integrity, in my opinion. Derek contributes up-to-date information about the industry, creative writing and publishing guides, book cover design tips, tools, and more. He can help you think outside of the box—that’s the kind of guy he is. You probably know this already—Kudos to you, Derek! I still don’t know if Oprah has read Deliverance Mary Fields, but I know that many of her readers have. 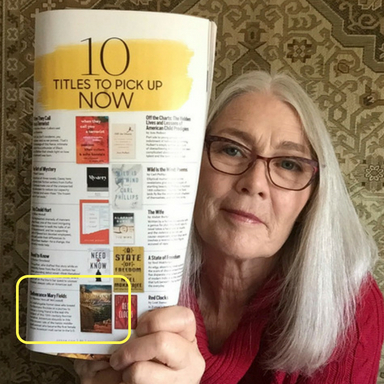 I am forever grateful to “O, The Oprah Magazine” staff for including it in the February 2018 “Ten Titles to Pick Up Now” list. I am currently writing a nonfiction adjunct to Deliverance Mary Fields titled Mary Fields’s Road to Freedom, an expository essay to answer reader inquiries, such as: where did you find your research discoveries, what documents did you use to validate information presented in the book? Do you have more photos? Mary Fields’s Road to Freedom will examine Mary Fields’s life in Montana and analyze available opportunities, options and consequences within nineteenth and twentieth-century social political environments. Copies of letters, documents, census and voting records, photographs, articles from state and local news periodicals and other sources will be included. These discoveries are the factual backbone of Deliverance Mary Fields. Estimated publishing date: November 2018. I recently signed a contract towards the development of a film for Deliverance Mary Fields! I’m optimistic! I hope your book rises to the top, whether it’s in O, The Oprah Magazine or in other publications or social media sites that will send your book sales skyrocketing!